I hate having my phone near water, so I has a clear cover over it, which contributed to the blurriness of the photo. I like the appearance. In case you’re not aware, Kente cloth is a cotton fabric that has no stretch to it at all. So in order to wear this as a bikini, it had to be lined with a stretchy fabric. 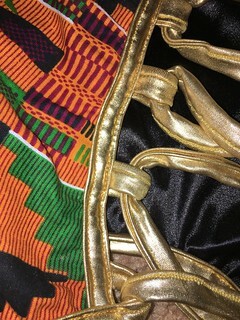 The outer fabric is the Kente cloth, and the lining is a stretchy black fabric. 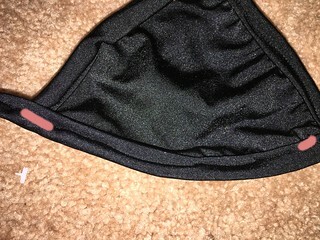 Both the top and the bottoms use the same black fabric. 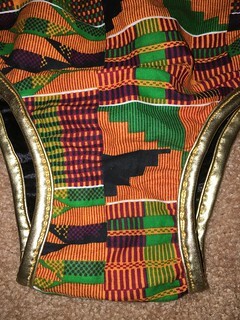 On the top, the Kente cloth, and the lining are not sewn together. 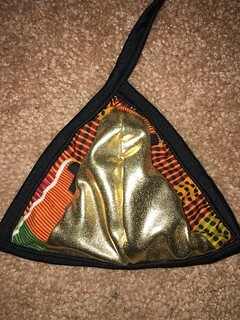 The gold ‘binding’ used on the bottoms is a stretchy fabric. The binding on the top is also stretchy. I can’t say what the actual lining fabric is but I’d assume some sort of nylon/spandex/rayon blend. When I first saw the bikini I was so happy. It was exactly what I thought I wanted. But then I really looked at it. And I’m not really happy with it, especially considering how much I paid for it ($112). 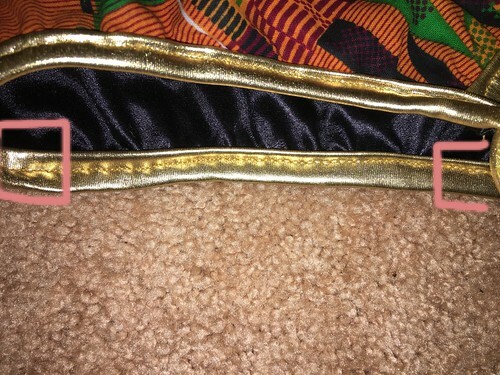 I am not a seamstress, I’ve altered a few items using a sewing machine (I can hem a pair of true religion jeans with little issue), however the sewing on this set is not good. The pink denotes where the stitching is. You can see on the right side the stitching is more towards the top, but on the left side it’s in the middle. 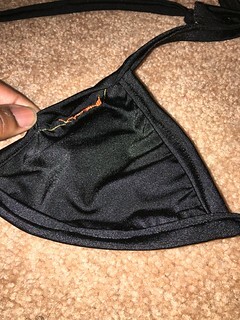 The biggest issue I have with the quality of the sewing, is that there’s a piece of the top boning that isn’t attached to the inner part of the bikini top. This is something that should have been caught before the item was shipped out. I’ve had this happen to me before when I would hem jeans. But I would always catch it, and I would also always take it out and redo it. If I would have gotten this set like, a month before I had to go on vacation, I would have returned it, but since I got it the day before,I decided to keep it. I wasn’t 100% in love with the fit. It’s high waisted, and y’all know how I feel about high waisted bottoms. But that’s me, and not the bikini. I do feel as though with the side lacing and the high waist, I look like I don’t have hips. The crotch did seem to be on the wide side. But the back coverage was what I like. Another thing I didn’t care for, was putting it on and taking it off. I had to lace it up, and unlaced it. So I tried to not use the bathroom too much. The loops did feel stable when I tightened the sides. I dont love this set. I didn’t message the seller to tell her I wasn’t happy with the set. I didn’t ask for a refund (full or partial), because I’d already worn the suit. I most likely won’t be paying this much for a set again. I don’t think the set was worth what I paid. I know that when you’re buying something from etsy, or something that is handmade, you’re paying for the labor, as well as the cost of the materials. Wow, bummer about the sloppy sewing on this expensive bikini set! I’m sorry this was such a disappointing experience. I do love the lacing on the sides, though. It’s eye-catching and unusual.